It starts quietly, and ends without drama, melo- or otherwise. After The Lunchbox and its tad disappointing followup The Sense Of An Ending, you know how it is with Ritesh Batra. This is a filmmaker who loves silence and embraces it with all its inbuilt hazards and uncertainties. We’ve seen him work wonders with wordless emotions in his earlier works. So no surprise if here he once again weaves a luminous lucidity into the looming stillness of a landscape that won’t judge mankind. Kindly or otherwise. 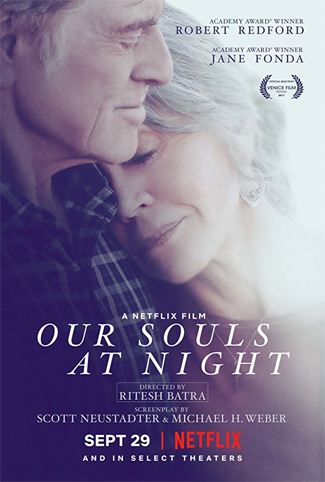 With Our Souls At Night, a deeply stirring gentle humane drama about two autumnal souls drifting together in ways that The Bridges Of Madison County could never fathom, Batra joins the ranks of the greatest living filmmakers. And we are not speaking of India alone. Batra is a talent that exceeds boundaries beyond belief. Just think. An Indian director direct two of Hollywood most iconic legendary actors. It would have sufficed that Batra doesn’t allow himself to get overawed in the august presence of Robert Redford and Jane Fonda. But that is not enough for this director. Having given them to play lonely old characters hungering for company –in short humanizing them to the point of completely denuding them of their mythical status—Batra then proceeds to bring them together in a tale so soft, slender, tender, and fragile, it could easily lapse into insignificant understatement (I felt that way about Batra’s The Sense Of An Ending). This is where Batra scores over other modern filmmaker who deal with human relationships on a low-key decibel. He strips Fonda and Redford of all their Hollywood-legend aura and yet preserves all their charisma. The more vulnerable and human they become, the more we embrace their inadequacies for what they are: legacies of mortality embedded in immortal personalities. This remarkably quiet film opens with Fonda playing the stately but broken Addie, knocking on her neighbour Louis (Redford)’s door one night with an offer he dare not resist. Since we are both so devoid of companionship, why don’t we sleep together? Addie suggests. From there, Batra’s screenwriters (Scott Neustadter, Michael Weber) build on Kent Haruf’s slender story of old age and solitude, into a reverberant requiem on life and mortality. Besides thesheer beauty and harmony with which Batra textures the protagonists’ gentle journey, the film is also unforgettable for the way it is shot. The green stillness of small-town Colorado is such a befitting counterpoint to the film’s ode to lonely hearts, it is almost as though the director’s vision is in collusion with his characters’ inner landscape. Batra is never in a hurry to build Redford and Fonda’s relationship. The warmth and glow that creeps up into their friendship is as organically achieved as the gentle sunrises and sunsets that peek over the Colorado skyline. Our Souls At Night is very beautiful film. And cinematographer Stephen Goldblatt must be credited for capturing the sublimity of the Coloradan landscape without fawning over it. Our Souls At Night is a film whose rippling resonances will follow us into many nights to come. The film is not afraid to let the characters think while we wait for them to articulate their thoughts. A major part of the film’s magic comes from Redford-Fonda’s togetherness. Watching these two stalwarts come together to serenade the vicissitudes of vulnerability is a pleasure that far transcends the thrill of two superstars making a comeback. Redford and Fonda are joined by some exceptionally unassuming actors. Matthias Schoenaerts as Fonda’s son and Judy Greer as Redford’s daughter leave a very strong impact in their limited screen-time. This is possibly to do with the fact that they speak lines which reveal devastating lapses in the protagonists’ past. But it’s the little boy Iain Armitage playing Fonda’s grandson who proves a major turning-point in the plot, providing, as it were, a point of innocence and reclamation in a story that repudiates all the benefits of dramatic construction and tension to simply meditate on the mellowness of existence. This is a film of wondrous eloquence, where words are not allowed to get in the way of the feelings. The background score (Elliot Goldenthal) merges so seamlessly with the goings-on that we never get to know when this little film with a big heart just steals away a part of us never to return it to us again. And that’s perfectly in sync with what the film desires to say about the irretrievable losses of life. No point in mourning over what’s gone, Our Souls At Night celebrates life without fanfare or frenzy. Meditative, melancholic and elegiac it is as perfect a portrait of lives well spent and unrepentant of past transgressions, as any we’ve seen on screen. Our Souls At Night released on Netflix on September 29.